Works on battery or mains power. 20 minutes autonomy for only 23.5 kg. 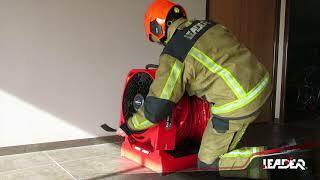 Equipped with a battery, BATFAN 2 allows operations to be carried out independently. In addition, it does not need to be connected to a power source, which avoids another accident to occur due to cables dragging on the ground. Lightweight and equipped with a carrying handle and strap, it is portable by one person. Folds up and stows easily in the trunk of a vehicle. Two BATFAN occupy the space of one conventional fan. BATFAN is quicker to set-up than conventional fans. Thanks to its battery, BATFAN 2 is completely autonomous and can be started instantly without wasting time looking for a power outlet. Accessory that allows to channel the air or extract smoke during complex interventions.